The Chinese script is truly special. It was reformed from several types of writing into the present script with the unification of the Chinese empire under the First Emperor, ca. 200 BC, and it has remained the binding force between all the different cultures, languages, and peoples of this vast country up to the present day. Even though the Chinese could read the characters and understand their meaning, the peoples from different regions could not understand each other’s languages when spoken. Being able to write and read became the basis for governing the empire and education the path to wealth and glory. But what if texts become meaningless and nobody can read the characters? Dr Lennert Gesterkamp (Utrecht University) takes us on a journey through the work of Xu Bing. 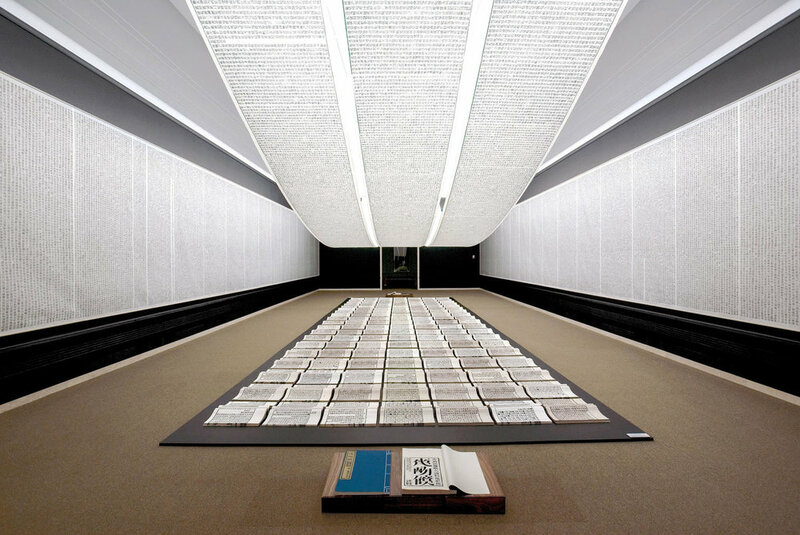 When Xu Bing (1955) first exhibited his Book from the Sky in Beijing in 1988, the Chinese were, understandably, shocked. His installation consisted of ca. 400 books printed in the traditional manner with woodblocks but with characters that resembled Chinese characters closely but that at closer inspection were entirely unreadable and, therefore, meaningless. Following the set rules of brushstrokes, radicals, and composition of traditional Chinese characters, Xu Bing had “invented” some 4000 new Chinese characters, a number that would allow a Chinese to be literate and “read the newspaper”, but which had become useless without the common historical and cultural background. Evidently, many Chinese did not know exactly what to think of Xu Bing’s work of art or how to interpret it, and not surprisingly the initial Chinese reception was very negative. Very soon, Book from the Sky went abroad and people in the West, perhaps unhampered by any historical or cultural baggage concerning the Chinese script, were much more positive and saw a genius artist breaking the mold and shattering established conceptions on and connections between words, images, text, and meaning, aspects that all converged in the Chinese script and that were now suddenly placed on shaking ground, ready to tumble and fall apart. Book of the Sky became an instant classic and Xu Bing one of the first pioneers of Chinese contemporary art crossing over to a western audience and reaching star-status in the West. Despite its fame, its numerous exhibitions all over the world, and uncountable scholarly publications, Book of the Sky remains enigmatic about its precise meaning or purpose. Xu Bing for one has remained silent on this aspect. The West thus far has gauged the work in typical art theoretical discourses and focused predominantly on the “Book” part of the exhibition; the “Sky” part has thus remained unexplained. This presentation will therefore place Xu Bing’s masterwork in the perspective of Chinese art history where no-meaning and no-use has always been considered the highest form of art. Dr. Lennert Gesterkamp is a Chinese art historian specializing in Chinese painting, Daoist art, and cultural exchanges between East and West. He studied sinology at Leiden University and art history at SOAS and got his PhD again from Leiden University. He did research as a postdoc for five years in Taiwan and China and is currently a postdoc at Utrecht University in the research project The Chinese Impact: Images and Ideas of China during the Dutch Golden Age.